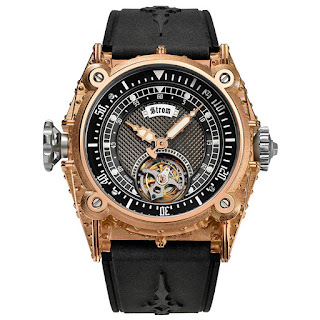 There is no escaping the bonkers nature of this diver nor the obscene price tag that it must surely have but that’s because it not only belongs to an elite group of divers watches known as the diving tourbillons, but also because it comes from the mind of designer, philosopher, watchmaker, Daniel Strom of Strom Agonium. 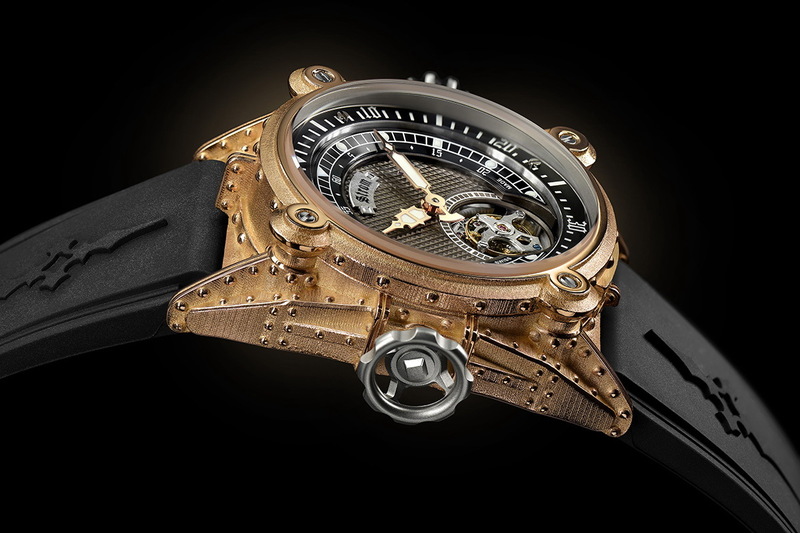 We’ve seen the Jules Verne-esque, Strom Nethuns II before, a dive watch named after the Etruscans god of water and styled in a way that would not look out of place on the wrist of a Victorian fantasy hero. However, this time around the Nethuns II has been handmade in 18 Ct Red Gold and boasts a Flying Tourbillon. 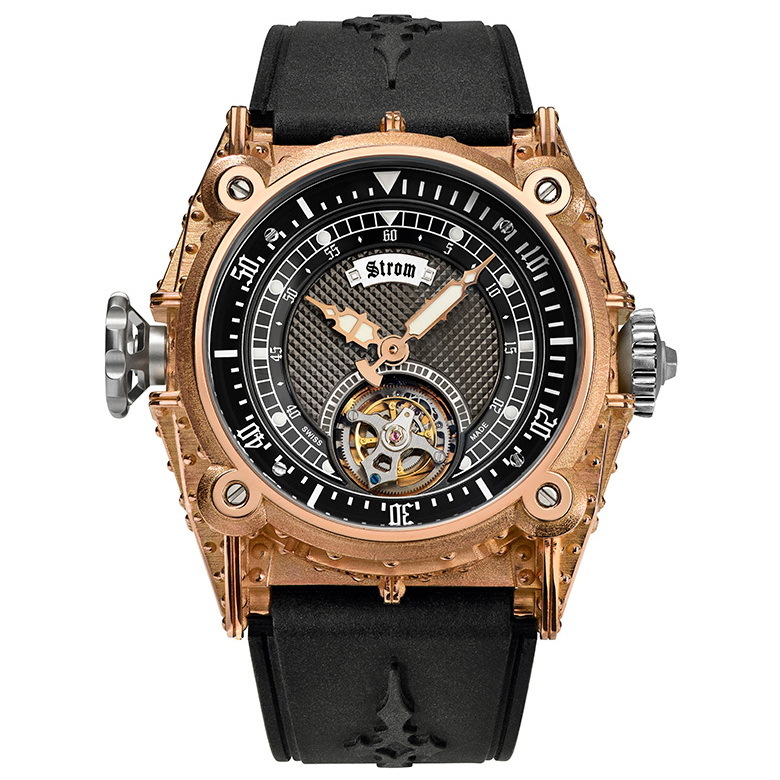 The Calibre AGO-3024 which is equipped with a 60-second automatic flying tourbillon with a frequency of 4 Hz. It beats 28’800 times an hour in a Titanium cage. Accurate and lightweight, it has a rapid-rotation double-barrel in series and a variable inertia balance and a depth of just 4mm. 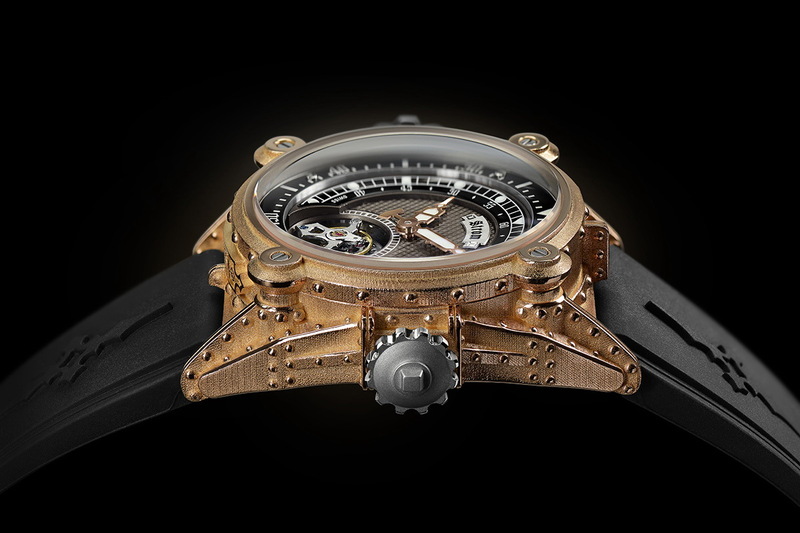 The automatic movement also has an 18 Ct gold oscillation weight. The intricately sculpted case is matched only by the Silver handmade dial with guilloche pattern with luminous treatment; a sight to behold. Basic diver specs. Include: 200 meters of water-resistance, a Sapphire crystal and screw-down crown. The watch is presented on either a custom black rubber divers strap or brown handmade Alligator strap – both with 18 Ct. Rose Gold buckle. Price: unknown. So what do you think? Bit of a marvel me thinks but not really anything I would ever aspire to owning.